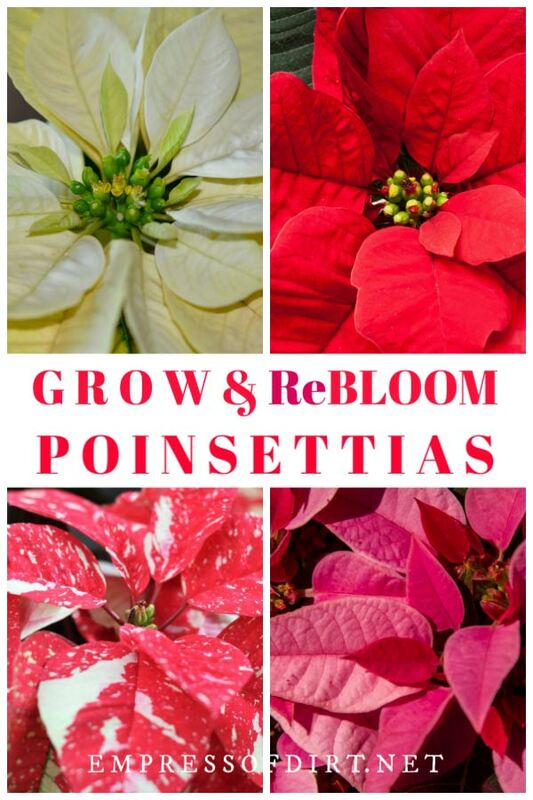 Want to keep that holiday poinsettia growing? 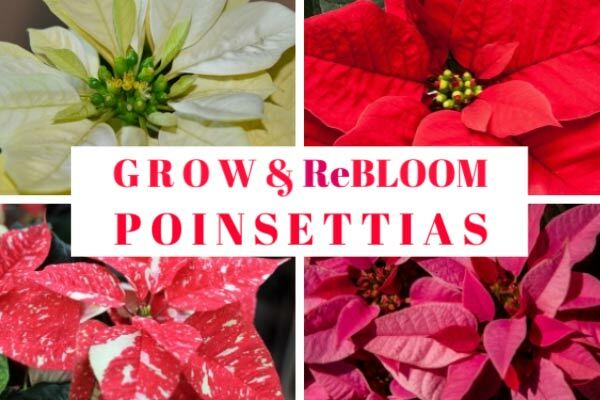 With proper care you can grow poinsettias indoors as houseplants year-round, and, with these tricks, get them to bloom again. For more, you can also find How to Grow Orchids which includes my mom’s top tips for growing her favourite flowering plants. Because poinsettias are not frost hardy and do not tolerate temperatures below 50°F (10°C), our only option in a cold climate is to grow them indoors. 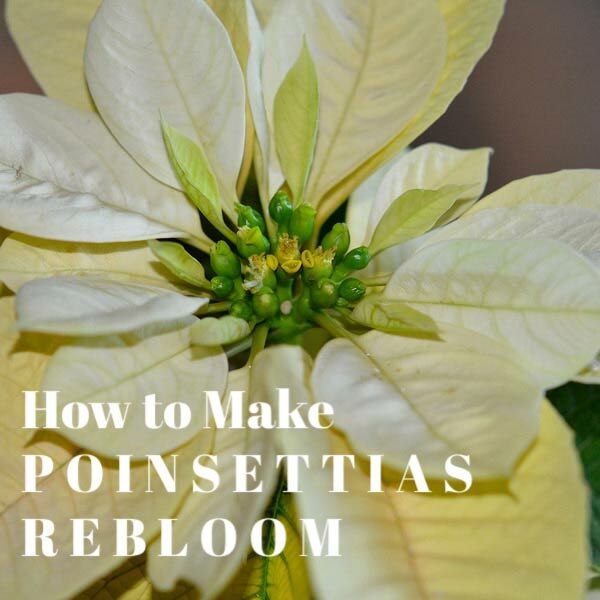 From there, one of the most common questions is, how do I get my poinsettia to rebloom? Reblooming is possible but you should manage your expectations. While you can definitely keep your poinsettia going as a houseplant all year-round, getting it to bloom again takes extra effort and does not always succeed. You can force it at any time of year, but we generally wait until fall so it has had a rest period and the colorful leaves return for the holiday season. And while there are no guarantees, it’s worth a shot! I’ll walk you through the basic care and show you how to encourage those holiday colours once again. Can I keep my poinsettia indoors year-round? How can I make my poinsettia stay red? How do you prune a poinsettia? How long do poinsettias live? How to you revive a poinsettia? How can I make my poinsettia turn white? It’s always helpful to know the origin of a plant to better understand what it needs. Poinsettias (Euphorbia pulcherrima), also known as Christmas star, are indigenous to Mexico. They grow as shrubs, reaching heights of 12-feet tall, with the familiar red and green foliage and tiny yellow bud-like flowers. Now used as indoor holiday plants, a grafting trick developed one hundred years ago makes them grow as compact, bushy plants in containers. A poinsettia’s true nature becomes apparent as we grow them on as houseplants after the holiday season, and the dwarfing chemicals used in greenhouses wear off. The stems start to become leggy and tall, just like their ancestors were, and some pruning is needed to keep them looking compact and full. With over 100 cultivated varieties, poinsettias come in all sorts of colours including the traditional red, apricot, salmon pink, orange, yellow, cream, and white. There are also plenty of multi-hued, marbled, and speckled variations. You may also notice unusual blue, purple, and sparkly silver ones in shops: those are dyed and glittered, and, well, perhaps not really suitable for those of us who like some nature in our plants. The true flower of a poinsettia is actually only the tightly-clustered yellow buds in the center (termed ‘cyathia’). The surrounding leaves that change colour are modified leaves called bracts. The rest of the plant has dense, green leaves. 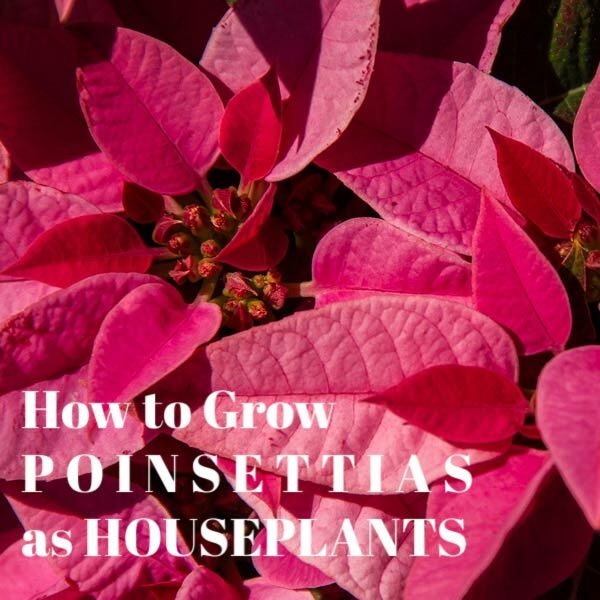 What makes poinsettias different than some other tropical houseplants is their intolerance for temperature swings, drafty conditions, and soggy soil. They do best with even conditions (60-70°F | 15-21°C) with diffused sunlight six hours a day, and the potting soil on the drier side, but never dried out. If temperatures go below 50°F (10°C), it can be game over. We know the plant was shocked when the leaves start to wither and die—not just post-Christmas leaf drop, but everything is down for the count. But I’m here to encourage you to grow them, not scare you off, so let’s keep going. You’ve got this. 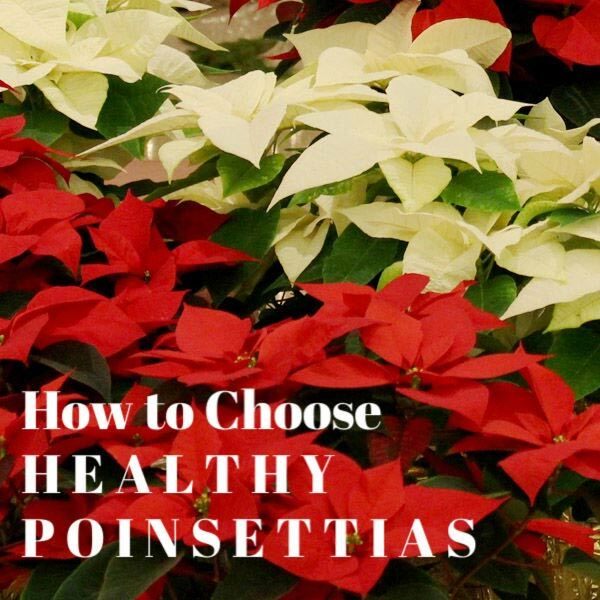 When buying a poinsettia, these tips will help you choose the healthiest plant with the best chance of a long life. The plant should have an overall healthy and robust appearance: no dying, yellowing, or fading leaves or other signs of distress. The flowers (yellow buds in middle of leaves) should be tight, not open or spilling pollen. Check the temperature of the container with your hands. It should be room temperature and not cold. Some poinsettias are (wrongfully) kept refrigerated prior to display in stores and this can cause a slow death. Avoid plant displays by the front of the store where automatic doors are letting wooshes of cold air in. The plant may look okay today, but a week from now it may die off. Put your fingertip in the potting soil to check the moisture level. You don’t want soggy soil, nor should it be so dry that the soil is shrinking back from the inner sides of the pot. Check under leaves for insects, eggs, or signs of munching. Let no buggy plants come home with you! When you’ve picked the best plant, it must be completely covered for the ride home to avoid exposure to wind and cold temperatures. There’s a honeymoon period of about 6 to 8 weeks where your poinsettia will look fabulous and require minimal care. Follow the watering tips below and keep away from cold drafts. Only water when the surface of the potting mix is dry to touch, and then, water lightly. Pour out any excess water that collects in the saucer. Remove the decorative foil wrapper if it’s gathering water. Never allow the soil to dry out, but never let it stay soggy either. I’ll walk you through a year of poinsettia care. The first half of the year is basic care. Then we take steps to encourage the plant to go into colour once again for the next holiday season. These milestones may not happen right on schedule, but you’ll get the idea of what to expect. As your poinsettia starts to look a little tired, we begin its first year as a houseplant. Provide six hours a day of diffused sun and water lightly when the soil is dry to touch. Don’t freak out if leaves drop or shrivel. It may be just recovering from the intense conditions that made it so pretty for the holidays. The next few months are a rest period. When new growth appears, you can begin fertilizing. I use liquid fish fertilizer (following the directions on the container) but you can use any general fertilizer made for indoor plants. If there are dead flowers or bracts, you can pinch those off. It may be time to repot the plant to a container one size up. Use a sterile potting mix made for indoor flowering plants. Some time between May and July, your poinsettia should be ready for pruning. Using clean tools, cut back stems to approximately 4-inches tall—some gardeners go down to as little as two-inches—cutting just above leaf nodes (those bumpy parts on the stems where leaves and shoots grow from). TIP: If you want to try propagating your poinsettia, now is the time. This tutorial shows how to take softwood cuttings and root them. When outdoor temperatures are consistently over 55°F (12°C), you can grow your poinsettia outdoors for the summer months. Place your poinsettia in indirect light to avoid sunburn, and never let it dry out. Continue watering as before, waiting until potting soil is dry to touch, and never soaking or starving the plant. I like to use half-strength fertilizer in the water all the time, rather than remembering to give full-strength periodically. The plant should start to regenerate during this phase, sending up new shoots and leaves. If it gets leggy, prune as needed, and wear gloves to avoid contact with the sap which can be irritating. Here in Ontario, Canada, some time around late August or early September, I start bringing my houseplants back in for the winter, just as temperatures start to fluctuate. Wash leaves gently with warm water. Use an organic insecticide to remove any critters. Return to a sunny, draft-free location indoors. The ideal indoor temperature range is 60°F (15°C) to 70°F (21°C). After a month or so indoors, it’s time to force your baby to get colourful once again. This is the part that takes some dedication to see it through. I set daily reminders on my phone because you have two simple tasks to do every day, as you’ll see. For this next stage, we’re going to alternate between periods of light and total darkness every single day for 6 to 8 weeks. Daytime: keep your poinsettia in the sunniest location you have. Nighttime: provide complete darkness for 12 to 15 hours a day (whatever fits your schedule). The easiest way to do this is to find a cardboard box large enough to set over the plant with the flaps splayed on the floor so zero light gets in. You might do this right by the window or choose to move the plant each evening to a box in another room and return it to the sun in the morning. Continue watering and fertilizing as usual during this time. Some time during this phase, you may notice buds (cyathia) forming or yellowing, and their surrounding leaves (bracts) gradually changing colour. Some people notice this as early as two weeks in. Keep going until your poinsettia has transformed. Not to be a Debbie Downer, but, as mentioned, some poinsettias won’t produce their original colours again, and others will change only slightly, but nothing compared to their original show. You can decide if it’s still a worthwhile houseplant or if you would rather send it to the Pearly Gates in the compost pile. Best case scenario, over the 6 to 8-week period, the buds turn yellow and the bracts turn red, pink, white—or whatever they shall be, and you get to enjoy the blooming phase all over again. Poinsettias are susceptible to fungal, bacterial, and parasitic diseases. Overwatering can kill a poinsettia or cause grey mold to form. A weakness in the plant or life outdoors can also attract mealybugs, whiteflies, and scale insect. If a pest problem arises indoors, I usually dispose of a plant rather than trying to treat it to avoid affecting my other plants. Life is just too short sometimes to fuss with these things. Not the way we have been led to believe. As part of the spurge family (Euphorbiaceae) including rubber trees that produce latex, poinsettias produce a milky sap which some people (like me) are either sensitive or allergic to. If handling the plant, use gloves to prevent skin or eye irritation. As for the rumors of being wickedly poisonous, it’s not so. Studies show they are not the dangerous plants we once thought they were. Turns out, poinsettias are bitter tasting—which is good because this helps prevent ingestion, and research shows it would take a huge quantity to cause problems. That said, if you have pets—cats, dogs, rabbits, or kids inclined to try these things, keep the plants out of reach. Yes, you can grow your poinsettia like other houseplants. Provide full, diffused sun, water lightly, and prune (with gloves on) if the plant becomes leggy. If you want your poinsettia to bloom (change colour) again, follow the instructions above. You can’t, really. When a poinsettia has red leaves, it’s in a flowering stage which last several weeks and sometimes months. After that, the plant needs a rest period where it can build up energy to (we hope) bloom once again. While you cannot force the leaves to stay red (or whatever colour they were ) continually, you can provide the right conditions to encourage a repeat performance as described above. Generally, we cut back or prune a poinsettia in late spring when the plant is finishing up its rest period. Using clean pruners or fine snippers, working one stem at a time, cutting each one back to approximately four-inches, just above a leaf node. Always wear gloves because poinsettias ooze sap that is irritating to skin and eyes. See the videos (below) for more pruning tips. Poinsettias are tender, tropical perennials, so, theoretically, if you provide the right conditions indoors (explained in full above), and never expose the plant to temperature extremes or shock it, it could last for many years. I remember my mother keeping them as houseplants, but I don’t think she pruned them because they tended to be leggy. But they kept on going. That’s a tough one! If the plant was shocked, either by temperature extremes, overwatering or underwatering, or wind (which dries out plants), it may be too late. You can try pruning away any dead or dying parts, place it in a draft-free sunny location, and water only when the soil is dry to touch. Sometimes they drop foliage after blooming, other times they are giving up the ghost. You’ll know in a month or two if it’s toast or there is new life ready to spring back. You can’t. 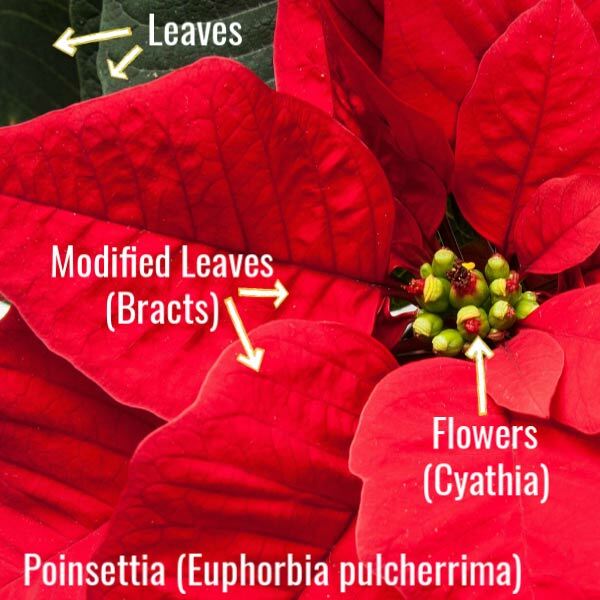 Poinsettias are bred in different colours. If you want a white one, you get a white one. A red poinsettia, for example, cannot be forced to turn white. That said, insufficient light can produce faded versions of the original colours. I hope you’ll try growing your poinsettia year-round. But, if you decide not to, add it to the compost pile and reuse the pot. We’ve got to do everything we can to make gardening greener. Thank you for your tips. I want to know if have any tips for a Christmas cactus. This year I manage to get to bloom. What about pruning? Hi Veronica, Christmas cactus will bloom if you decrease light, water, and temperature for a few months before you want flowers. No pruning necessary.